The Cocker Spaniel dog breed is part of the Sporting Dog Group. They are very popular dogs and can make a great addition to a family. If you are looking for a good family dog a cocker is a great breed to consider. They are faithful, happy dogs that are full of life and energy. They love being with people and are fairly easily trained. The “Cocker’s” that I have met love to meet new people and have a tail that doesn’t stop wagging in expression of their delight to meet you. They are easy to socialize and will get along well with other dogs and people due to their easy going attitude. You just need to make a point of introducing your spaniel to people and other animals early on. Even though they were bred to aid in the hunt of birds they will be fine with cats and dogs as housemates as long as they are introduced early on. A well cared for Cocker will live 10-14 years on average. Proper care includes good nutrition, regular veterinary care, plenty of exercise and regular grooming. Where to Adopt a Pet Dog? You should always take your time when you adopt a pet. 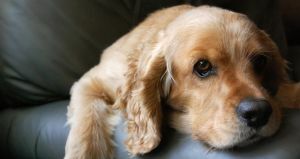 Even if you have decided that this Spaniel is the right dog for you it is important that you get one that is healthy. You can look at Animal Shelters, Dog Rescue groups, dog breeders, and Pet Stores. Don’t over look shelters or rescue groups as a good place to adopt a pet dog! The only time you should not is if having the dogs “papers” matters to you because you want to show your dog.